Wish your dear ones all the best with Best Wishes Cards. You can gift this Best Wishes Message Greeting Card for all type of ocassions. Convey your Best wishes to friends and relatives on her or his big day. Also we have clubbed this combo in a Good Luck wishes with Laughing Buddha gifting and Imported Chocolates. One of the strongest fengshui element, they are symbol of Good luck and Fortune. Laughing Buddha to call in positive energy in your life and good luck , fortune etc. The symbol of power , money and happiness. Grab this laughing Buddha showpiece and make your home beautiful as your life. Giftacrossindia.com has a combination of exclusive collection of imported chocolates this gift item will definately impress all with its quality and variety flavour chocolates. The combo has Toblerone, Snicker and many more all packed in a very stylish gift bucket. The overall attractive look of this hamper will amaze the receiver for sure and will be cherished for their entire life. imported chocolate Bar is very delicious in taste are especially handpicked for our special customers. The Imported chocolate has a very soothing taste and melts beautifully on the tongue. Chocolates are nice gift for any occasion. Every person prefer chocolates for the Birthday Gifts, Anniversary Gifts and many more as it is relishes by everyone. 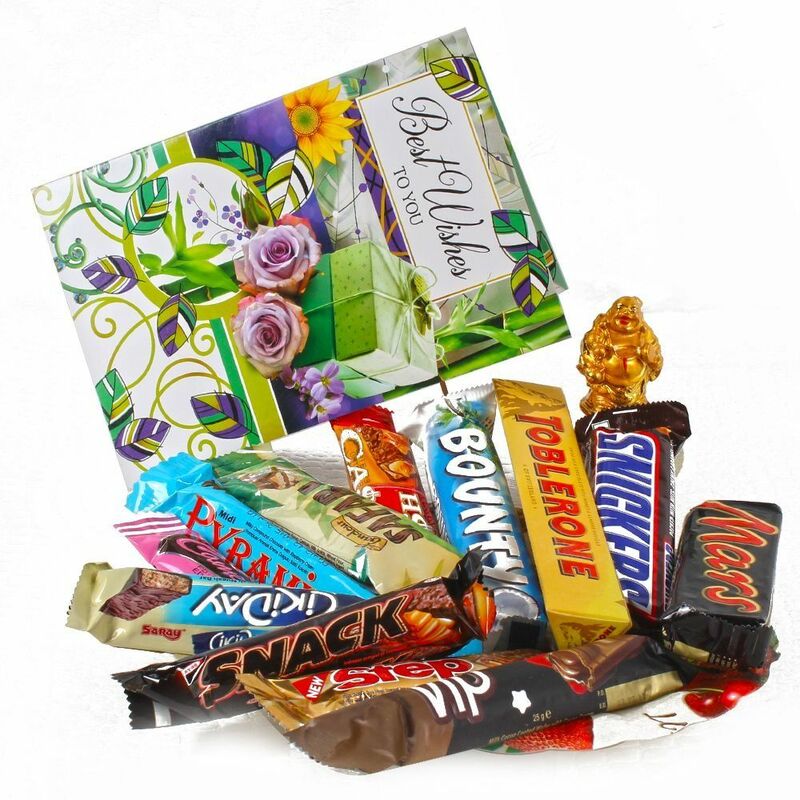 Tiny Lauging Buddha, Best Wishes Greeting Card along with Imported Assorted Chocolates Bars (Weight : 425 Gms).